NRH Nancay Radioheliograph (NRH) operated by the Observatoire de Paris and funded by the French research agency CNRS/INSU. (for a detailed description, see A. Kerdraon & Delouis, 1997). 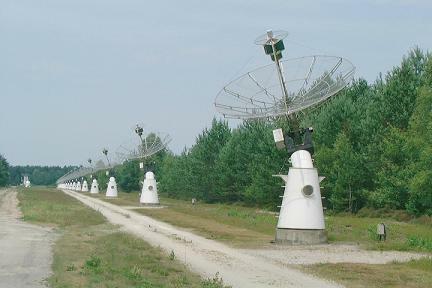 The NRH, located at longitude 2 degrees east, latitude 47 degrees north, consists in 44 antennas with sizes in the range 2-10m, along two arrays in the EW and NS directions. The EW and NS baselines are range from roughly 50 to 3200 m and 2440 m respectively. The NRH observes the sun about 7h per day, at several frequencies between 150 and 450 MHz. The standard observing mode consists in obtaining complex visibilities in Stokes I and V at 6 (before May 2008) then 10 frequencies (after May 2008), each 125 (resp. 250) msec. Two-dimensional images by rotational synthesis have also been produced at the same frequencies by using rotational synthesis. This has not been done systematically, but for about 220 days in summer between 2004 and 2013.